Time to turn back the clocks and let your light shine! As daylight saving time ends Sunday morning, Nov. 6, TriMet and our partners want to remind everybody to turn clocks back an hour, change the batteries in smoke detectors and increase safety when walking and biking. During the darker months, TriMet encourages our riders to “Be Seen. Be Safe.” Wear light or bright colors, add reflectors and/or reflective accessories and use safety lights. These steps are proven to increase safety. Also, make sure you can see as well. Look up and don’t let hoods, scarves or umbrellas block your view as you scan both ways when safely crossing streets and tracks. And for drivers, use extra caution in dark hours and rainy conditions, and always be on the lookout for cyclists and pedestrians. Safety is everyone’s responsibility. The U.S. Department of Transportation’s National Highway Traffic Safety Administration recently released data showing traffic deaths rose in 2015 by 7.2 percent over the prior year, ending a 5-decade long trend of declining fatalities. TriMet and partner street teams will be out and about throughout the region the week of November 7, handing out safety lights to riders. 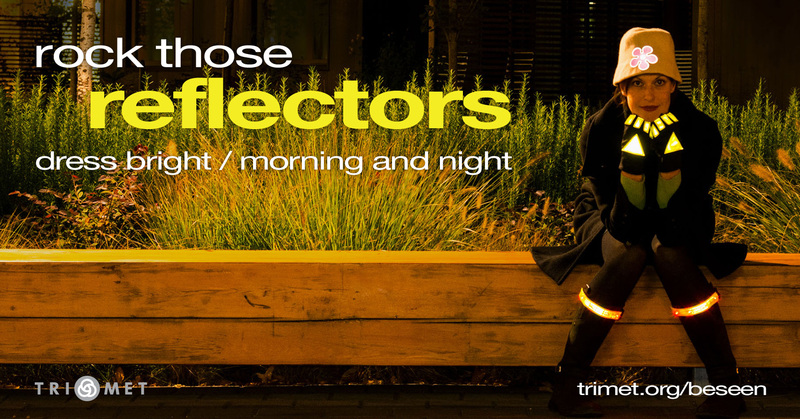 According to the Federal Highway Administration, studies have shown that the risk of being hit by a motorist in the dark is eight times lower when wearing a safety reflector. Companies make hats, coats, bags and other apparel/items with reflective elements. Or add reflective tape, stickers or reflectors to your backpack, coat or bike. Reflective vests can be found at local construction supply stores and can be an inexpensive alternative. Safety lights are the best way to see and be seen. Use lights freely whether on a bike or flashing blinky lights attached to clothing or bags. Many products, such as armbands, hats and vests, come with lights in them. Carrying a flashlight can be helpful too. Before you head out for the bus stop, think about your visibility. At some stops during the dark morning and evening hours, it can be difficult for our bus operators to spot riders. Wave a reflector, wear a safety blinky light, have a small flashlight or use your cell phone display to alert the operator as a bus approaches. Some mobile devices and mobile apps, including the free TriMet Tickets app, have a strobe or light feature for this purpose. Please do not shine flashlights or bright lights in operators’ eyes. It can also be helpful to wave as the bus approaches. Between 8 p.m and 5 a.m., in neighborhoods outside Portland City Center and Lloyd District, ask your operator if it is possible to be dropped off at a non-designated stop along the route. If the bus turns left in the same block as the requested stop, the drop-off will be after turn is made.